My sister has an amazing variety of farmer's markets near her house, and by near I also include available by taking the metro system which could still be a hop and a skip. She was at one of them a few weeks ago and found a hot chocolate pepper. She is a big fan of spicy foods and knows that I am to so she called and asked if I wanted her to pick one up for me. Yes, yes please. I had no idea what I was going to do with it, but anything called a hot chocolate pepper must be good, right? Right. So she bought one for me and wrapped it carefully and a few days later I had it and was so excited. I mulled over all sorts of ideas to put it in because this isn't an everyday pepper that you pick up at the grocery store (maybe for some of you, but not for me). She used it on a pizza and in a pork dish. I thought about the pizza idea but decided on slicing it super thin in rings and cooking it with the onions to make French Onion Soup Sandwiches. This was an awesome plan, just so you know. Also, this is no jalapeno, this pepper has some kick to it. If you don't like spicy, it's not for you. Apparently, after doing a little research I realized there is a hot chocolate pepper and a hot chocolate habenero pepper. I don't recommend getting those two confused for seemingly obvious reasons. 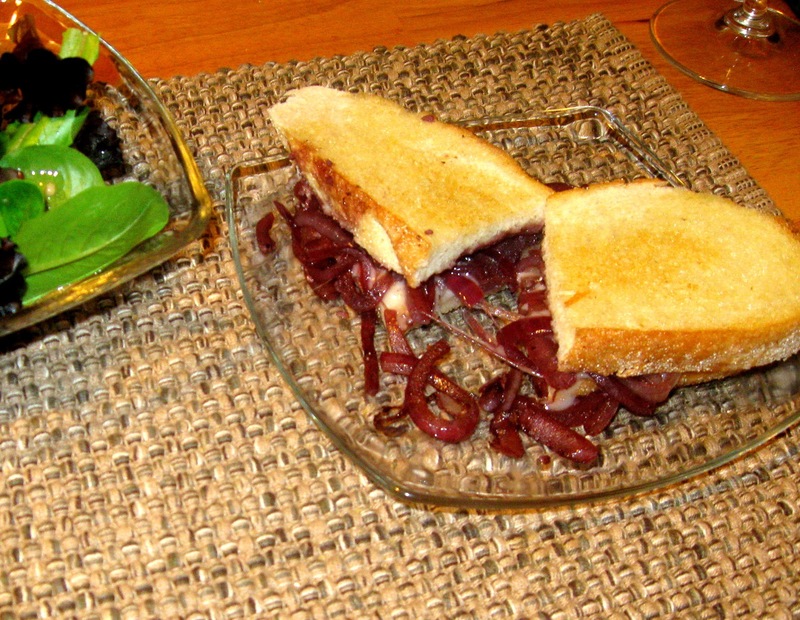 I used the whole pepper in these sandwiches but we really like heat in our food so for a little bit of kick, I would use a more mild pepper or only half of the hot chocolate pepper. I also used a mix of vidalia onions and red onions, I'm wild like that, mixing things up. Feel free to use whatever onions you like, yellow, white, red, or vidalia. I don't recommend green though :). One of the great things about french onion soup is the caramelized onion (or the melted cheese) and these help bring out the nicely caramelized onions perfectly. There are times when I will cook my onions for an hour or two on "2" or "3" on my stove just to let them cook slowly and come back and stir them every 15-20 minutes until I like their color. You could also use a different cheese if you like, but I like provolone, it's easy to obtain and is pre-sliced. I wish I would have taken more pictures, or better pictures? but I was really excited and it was already dark outside so I missed my opportunity with the natural light. You should definitely give them a try and come back and let me know what you think. In other news, I know I've been sparse in my posts the past few weeks and that does make me sad. I've been super busy. We are moving in one week and so things are disappearing from my kitchen into boxes and we are trying to use up our food for the most part so we don't have to move it. We are moving back to Virginia (from North Carolina) and so we have enough stuff without bags and coolers or food. I'm hoping to post one or two more posts this week but then I am hoping to get back to regular posts after the move. I just wanted everyone to know that I haven't been forgetting or moving on to other things, other things are just taking priority right now and so I'm sharing when I can, which is not as often as even I would like because there are so many ideas in my head. On a brighter note, today is the first day of the BlogCon conference which is an online conference I'm attending and I'm super excited. We are going to learn so much about our blogs and how to make them as awesome as possible for all of you, our lovely readers that we are so grateful to have! I am so thankful for everyone who checks my blog and reads it, and I get all excited when someone tries a recipe and shares their thoughts, or just comments. Thank you to everyone for that! 1. In a medium skillet heat the butter and olive oil over medium heat until the butter is melted. Add the onions, pepper, salt and pepper, and garlic. Saute in pan at least 20 minutes, stirring frequently to prevent burning. If desired, cook on low-medium heat for 30-40 minutes. The longer you cook the onions the more caramelized they will be. 2. Add in the worchestershire sauce and red wine, stir to combine. Let the mixture cook about 5 minutes or until the liquid is absorbed. 3. Meanwhile, butter one side of each slice of sourdough bread and heat another small/medium skillet over medium-high heat (I use 7 on my stove). When the onion mixture is ready then place one slice of bread buttered side down in the small/medium skillet and top with half of the onion mixture, one slice of provolone cheese, and another piece of bread, butter side up. Cool 2-3 minutes or until light golden brown on one side, then gently flip the sandwich to lightly brown the other side, another 2-3 minutes. Repeat with the remaining ingredients to make another sandwich. Serve warm. I love onions. So does my son. This is such a great idea for using some of the abundance I have from my dad's garden.